Tortilla presses come in handy for people who don’t really fancy eating at restaurants and prefer to make their own food at home. 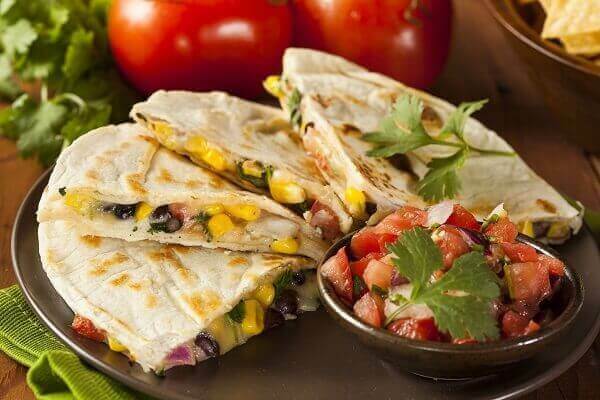 There are numerous types of tortilla makers on the market and they come from various brands. You can find both manual and electric presses and each type has its own advantages. For example, a manual tortilla press is usually less expensive and easier to maintain. It presses dough between two plates, making yummy tortillas for you. On the other hand, electric tortilla presses don’t only press the dough, but they can also heat up your tortilla. Some high-end electric models can also make pizzelles, pancakes, quesadillas and more. This review will cover 4 tortilla presses featuring different price points. Since this page is really long consisting of product comparisons, detailed reviews, pictures, videos a buying guide and more information on how I picked the products to review. I've created a table of contents to help you jump to the section of your interest. Below the comparison table, you'd find a general overview of the product, it's top features, problems you could come across while working with it. Also, as an added bonus, towards the end of each review is included a list of conditions under which I would personally buy the particular tortilla press. As a bonus, I am also going to include a quesadilla maker in this review. 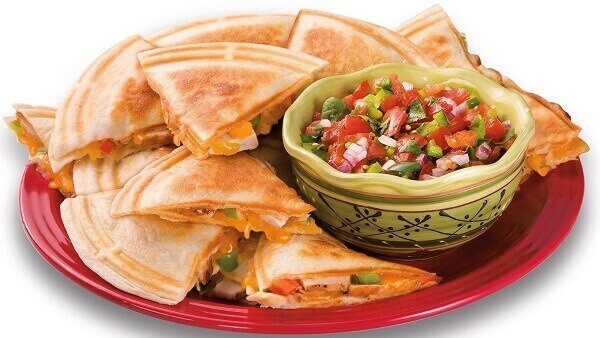 Quesadilla makers are used to create delicious sandwiches by pressing beans, vegetables or even meat between 2 slices of tortillas. I thought that once you prepare your tortillas, you might be interested in a device which allows you to enjoy them in one of the most appetizing ways possible. The products I picked up for this review come from reputable brands. I began my research by checking out multiple websites which contain quality tortilla presses and analyzing their pros and cons. I aimed for products which are appreciated by customers, have a rating of at least 4 stars on Amazon and are listed as Bestsellers or Editor's Choice. To make sure this review is helpful to everyone, I included four tortilla makers with different features and with various price ranges. Three of these tortilla makers are non-electric and one is electric. For the non-electric tortilla makers, I wanted to include a budget-friendly option and two mid-range options. If you’re looking for a high-end product, go for the electric tortilla maker which comes with added features. 6.75" x 8" x 4.6"
8" x 9.5" x 2.5"
10.2" x 9.9" x 2.8"
13.4" x 10.1" x 5.5"
Harold Import Co. is a company founded back in 1957. It strives to bring affordable cooking tools to its customers and has a wide range of products available on sale. The 6-Inch Tortilla Press from this brand is made in Taiwan and I picked it because it is a popular option among buyers as it is also compact and lightweight. When it comes to the actual amount necessary to press the dough, this varies depending on the results you want to get and the consistency of the dough. For example, some type of dough is easier to press and you don’t need to apply a lot of force. Thicker dough might require more force, but not by much. 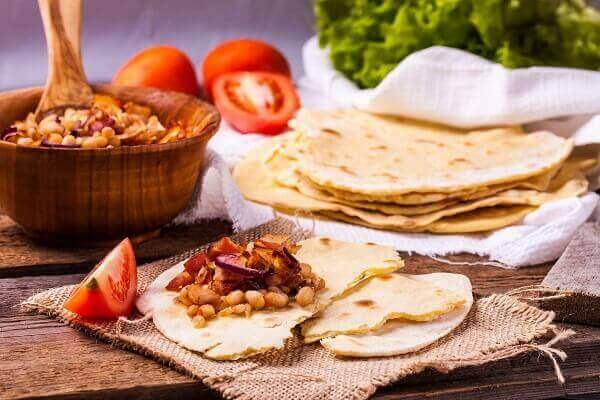 The desired end result should also be taken into account because if you prefer thicker tortillas (to hold vegetables and meat better), you don’t need to apply too much pressure when pressing the dough. This model from Harold Import Co. is not coated or seasoned. It is recommended to use plastic wrap or parchment paper to prevent dough from sticking to the press. The actual process is very easy, you just open the press up, put the plastic wrap, put the dough, put another sheet of plastic wrap, close the press, apply force, open it up, remove the first sheet of plastic wrap and there's your tortilla! This short video gives you an idea on how to use a tortilla press made from aluminum. Even children find it simple to use and this tool provides a great way to bond with your kids while making tortillas! Do your own research, check out other reviews on Amazon, maybe? Find out for yourself if this press is worth your money. Victoria is a family company founded in 1939 in Colombia. It specializes in cooking accessories such as tortilla presses, skillets, Dutch ovens and more. 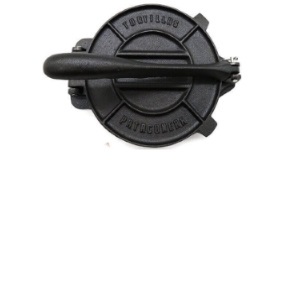 I selected the 6.5 inch Cast Iron Tortilla Press for this review because it offers good value for money and it is available in 2 sizes. Thousands of happy customers have left hundreds of 5-star ratings on Amazon and other stores. This model from Victoria is handmade by professional artisans in Colombia and ensures that you get some of the best tortillas possible. The press is also pre-seasoned with vegetable oil and it includes a lifetime warranty policy from the manufacturer. The press can handle a maximum temperature of 500 degrees Fahrenheit and it can be used with gas, electric, glass or induction stove tops. The press might be heavy for some people, so be extra careful when using it. The 6.5 inch model weighs almost 6 pounds while the 8 inch model weighs 7 pounds. I would definitely recommend this tortilla press if you're looking to make small tortillas, whether occasionally or often. Feel free to check out other reviews of this product on Amazon, before you make a buying decision. Iron World makes affordable kitchen appliances from cast iron. Its range of products includes skillets, pizza pans, tortilla makers and other products. 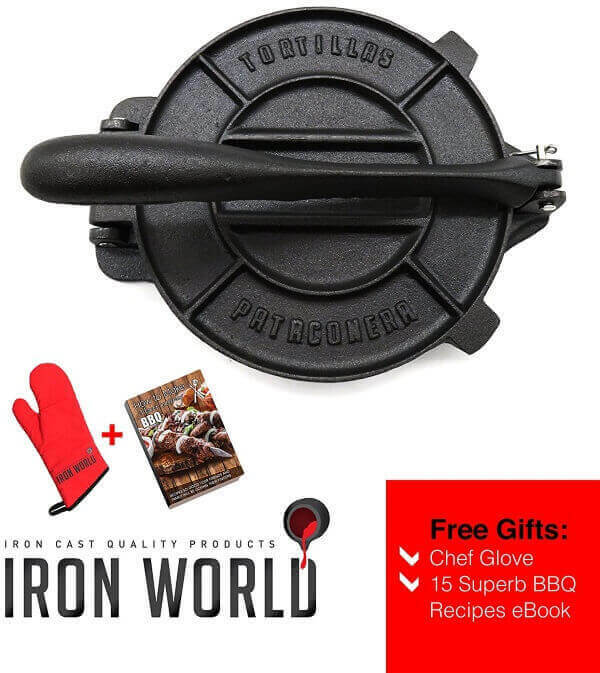 I have chosen the 8 inch tortilla press from Iron World because it comes with accessories, it allows you to make large tortillas and has multiple positive reviews. It is said that cast iron tools add a tiny amount of iron to the food made in them. This is no reason to buy this, but it's an interesting fact. Deers lick train tracks for the same reason. It's a big problem in Japan. It can be cleaned relatively easy, but you have to follow a procedure recommended by the manufacturer as described below. Cast iron tools are very durable and long-lasting, but they won't last a lifetime if you don’t take care of them properly. For example, to ensure that your tortilla press from Iron World remains in excellent condition over the years, make sure you rinse it with hot water immediately after you have finished cooking. Remove food remains using an abrasive product. If your press has developed a sticky coating, you can get rid of it using steel wool. Proceed in a similar fashion if your iron product has developed rust too. After you're finished scrubbing your tortilla press, rinse it again with water and apply cooking oil on its surface. Any cooking oil will do fine. To prevent dust from gathering on your press, cover it with paper towels or put it in an enclosed cabinet. That’s it! If you're not convinced yet, check out the customer reviews on Amazon and see what others have to say about this tortilla press. At the end of the day, this product is designed to help you press dough and heat tortillas, exactly what it was meant to be! if you want more bells and whistles, check out the following tortilla press which is an electric device. 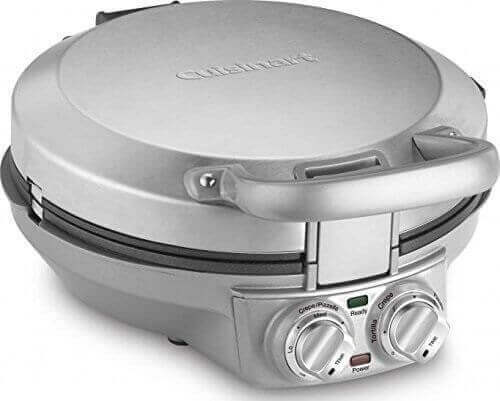 Cuisinart doesn’t need any introduction as it is a leading manufacturer of kitchen appliances and electronics. It currently sells thousands of products worldwide and its range of products includes coffee machines, tortilla presses, waffle makers and many, many more. 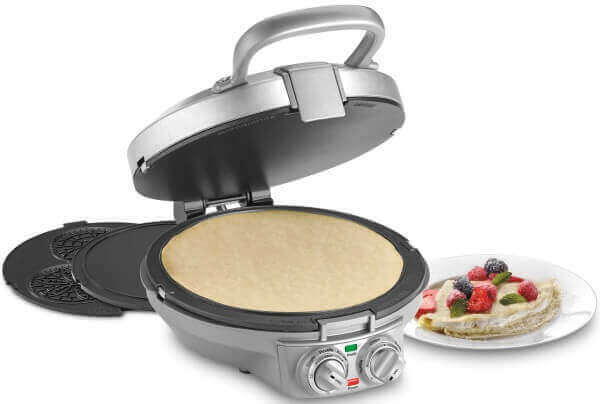 I want to feature a high-end option made in USA in this review because this electric device doesn’t only press dough into flat tortillas, it can also heat them quickly and prepare other goodies such as pizzelles, pancakes and more. This is another "delicious" video where the chef prepares crepes with fruits. The same procedure can be used to make tortillas. If you are looking for a professional tortilla press that can also make other dishes, this might be your safest bet. The device is protected by a warranty period of 3 years and it is very easy to clean. It is capable of producing up to 1,000 watts which basically means that your food is going to heat up very quickly. During my research I found out that making a crepe can take as little as 90 seconds which is not bad. It comes with a detailed instructions manual and it can be used to make almost any type of flat bread, waffle cones or roti. I am sure that by now you have a decent amount of data to make an informed decision, but if you want to see the opinions of the customers who used this product, feel free to do so. I really like this device because it gives you multiple options such as preparing tortillas, pizzelles, crepe, roti and many others. In other words, why spend hundreds of dollars on appliances that prepare these items separately when you can have all of them in one product at a convenient price? 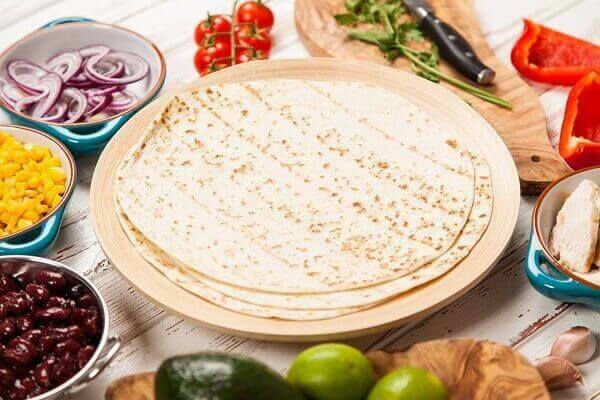 Now that you have a broader understanding of tortilla makers, I wanted to present you a "bonus" product which will help you prepare delicious dishes with the tortillas. 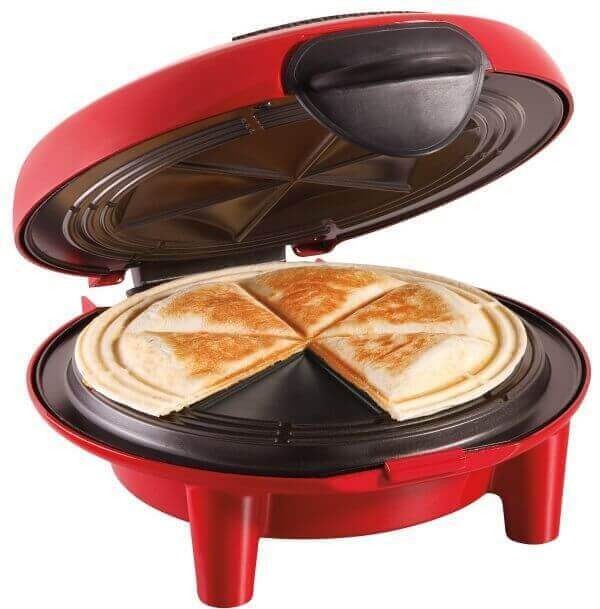 This product – the quesadilla maker – might give you cooking ideas and help you experiment with your tortillas once they are ready. The product I choose is a popular one from Hamilton Beach. It currently sells thousands of products such as food processors, coffee makers, quesadilla makers, grills, you name it. 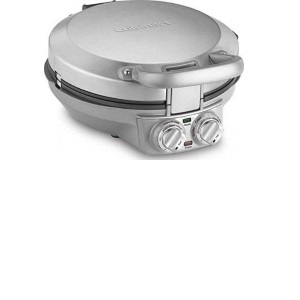 The 25409 model from Hamilton Beach is a great quesadilla maker which splits your tortillas into 6 wedges and I found that really useful. Another thing that I want to bring it up here is the inconsistency regarding the warranty period offered by this product. On the manufacturer's page, you'll see a picture which states that it comes with a 5 years warranty. But, if you open the usecareguide found on the same page and you look for the word "warranty" (Ctrl + F and type warranty), you'll arrive at a section that mentions the warranty period is just 1 year. If you want to know more about this product, you can check out some pictures and reviews by customers on Amazon. Regarding the warranty issue, you can call toll-free customer service numbers at 1-800-267-2826 for Canada and 1-800-851-8900 for USA. A tortilla press is also known as a tortilla maker. 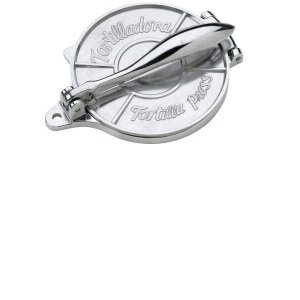 It is a tool designed to save time and facilitate the process of making tortillas. 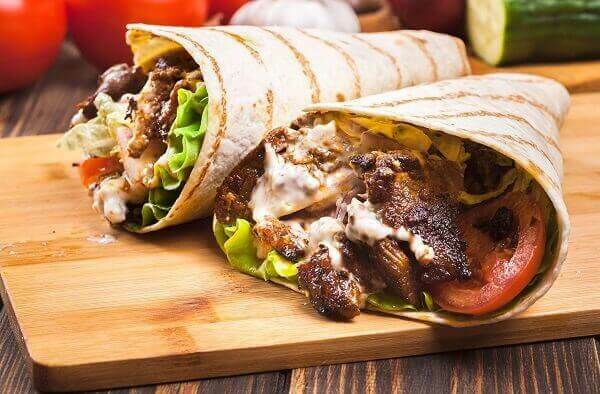 The traditional way of preparing these dishes is by taking a chunk of dough and roll it until it becomes a thin sheet. This might not be a big problem if you make 3 or 4 tortillas, but what if you want to make 30-40 for an upcoming event? In that case, rolling the dough will eventually become a serious upper body workout which might leave you exhausted in less than 10 minutes. In this case, a tortilla press is the perfect tool to facilitate the job at hand. All that you have to do is prepare your dough, use plastic wrap or wax paper if necessary, put the dough on the center of the plate and close the press. Use as much force as necessary to make a tortilla of your desired thickness, but remember,even if you try to press hard, the amount of effort involved is much less than if you would use a roller. If you want to buy a tortilla maker but don’t currently know which one is suitable for you, this guide will be really helpful. I created it to outline all aspects related to tortilla makers and assist you in making an appropriate decision. Just like Arnold Schwarzenegger said, "I left no stones unturned", so let's dig deeper into this guide and learn the basics of tortilla makers. It is important to know what to look for when buying a tortilla press. Here are some of the most important aspects. This is the most important aspect for obvious reasons. 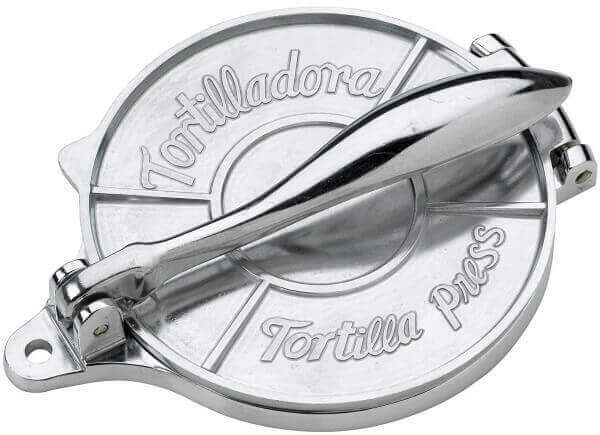 At the time of this writing, most tortilla presses[People already know they are called makers or presses by now after the intro. This could kind of lead to keyword stuffing in some sense] are available at prices between $15 and $100. You can definitely find more expensive tortilla makers, but the pricier they get, the more features they pack. To make sure you don’t overspend or underspend, try to set a budget right from the start such as, let's say, $30 or $50. Then look at the products which fit your budget range and you'll be more likely to make a better decision. "To be electric or not to be? This is the question." 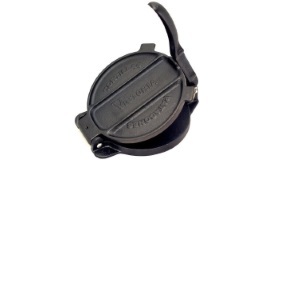 The differences between an electric tortilla press and a non-electric one can be huge. For example, all electric ones can also heat up your tortilla and eventually prepare other types of foods such as pizzelles, crepe, even quesadillas. As a result, you get a kitchen appliance that can perform multiple tasks which is convenient if you spend a lot of time in the kitchen. If you decide to go for electric tortilla makers, be prepared to spend more than $50, on average. Still, don’t get discouraged as these products usually come with a reassuring warranty period of at least 1 or 3 years, so your investment is protected. Don’t forget to read the instructions manual before using it. On the other hand, if you don’t really intend to warm up your tortillas directly on the press, go for a non-electric one. A non-electric tortilla is easier to maintain, doesn’t consume any electricity [The amount spent is negligible considering that you have to heat the tortilla on a pan to cook it in the end if you don’t use an electric one. ]and usually occupies less space on your countertop. Before settling for the actual products, make sure you pick the right brands. Although this might seem like a small detail, it makes a big difference. For example, would you buy something which is advertised to be a superior product, but it comes from brand you never heard of? Most likely no. Would you buy something from a reputable brand with maybe 50 years of experience in the field and with huge popularity all over the country? If you're like most people, the answer is yes. Every customer buys a product with the intention to use it for as many years as possible. Therefore, make sure you only settle for well-known brands (I picked tortilla presses only from trustworthy companies for this review) and don’t hesitate to contact them if you have questions. Products which come from reputable brands are more likely to offer you decent customer support and let you take advantage of the warranty which accompanies your product. In this review, I picked one tortilla press made from aluminum, 2 made from cast iron and one made from a combination of iron and stainless steel (the electric one). Each material has its own advantages and disadvantages. For example, aluminum is lighter, so the press is easier to maneuver, but it might not be as durable as a cast iron tortilla maker. On the other hand, products made from iron are more durable, but heavier and might require some periodic maintenance such as seasoning. Ultimately it is up to you and how comfortable you feel with that particular type of material. In a similar way, size is also important, especially if you have a relatively small kitchen with not much space left to spare. The size of the tortilla press is usually directly related to the size of the actual tortilla sheet. In other words, if you get a larger press, it can make larger tortillas. This review includes products which can make tortillas from 6 up to 8 inches. Why shouldn’t you be interested in some additional perks for the money spent? Prestigious manufacturers don’t mind offering you accessories that go well with the products you purchase. For example, some brands add a barbecue glove and an ebook with recipes which can be seriously helpful for people who want to know what they can do with their tortilla press. If you go for electric models, in the package you might find tongs for placing and removing the tortilla safely as well as measuring spoons for dough. The warranty policy is also important because it protects your investment. 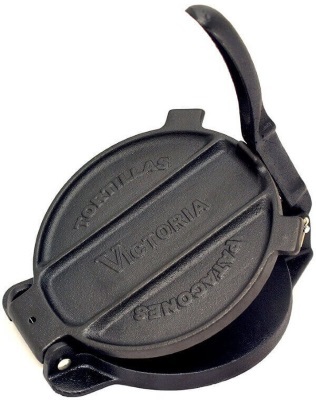 Most companies offer a warranty period of at least 1 year and in the case of cast iron tortilla makers, the warranty period can stretch for a lifetime. Make sure you find out about this when buying your tortilla press so that you can ask for a replacement or a repair service should something go wrong with your product. Tortilla presses are good for flattening chunks of dough, but some of them can also be used for focaccia and pita bread. 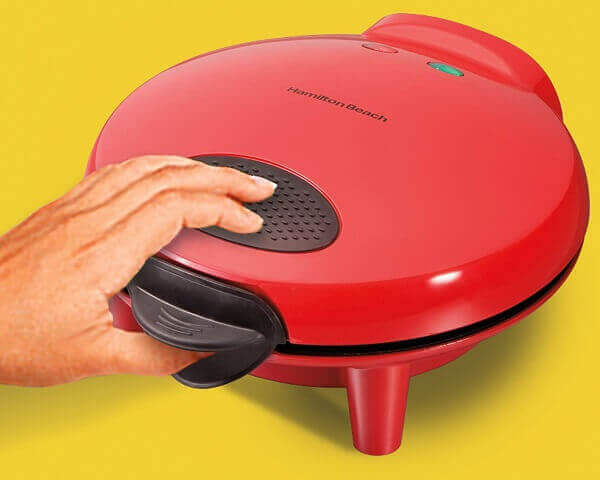 In some cases, you can use your tortilla maker to prepare pizzelles, crepe or even pancakes. Learn how versatile your tortilla press can be and then decide if it is worth the money or not. Not many people enjoy cleaning, but with the right tortilla press, it will be quick and easy. 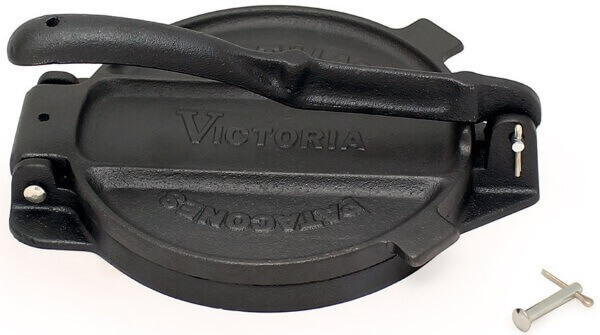 For example, if you go for cast iron tortilla presses, they can be cleaned easily as they usually feature a nonstick coating on the plates. All you have to do is remove food remains, rinse with hot water and apply vegetable oil. 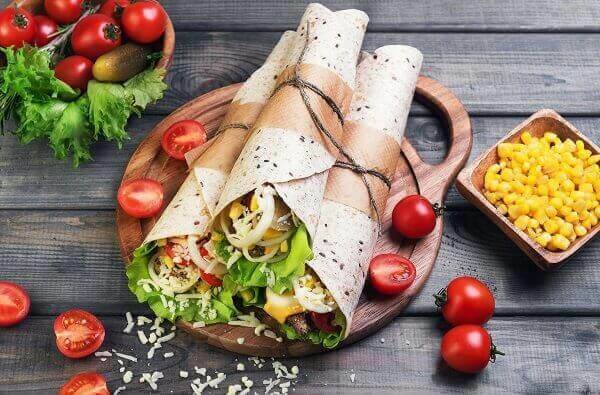 To prevent food from sticking to your tortilla maker, you can also use the aforementioned plastic wraps. If you opt for an electric tortilla press, the plates are usually removable and dishwasher safe, so your cleaning process is even easier in this case. Remember that it is your right to look at what other customers have to say about a certain product before buying one. Feedback from other customers can be a very empowering tool and it can actually make the decision for you. I recommend looking at the customer reviews on Amazon, but if you feel you need more than that, look up for your products on Google and see what others have to say about them. As you can see, there are numerous aspects to keep in mind here, but don’t let this overwhelm you. When buying a product, the best way to make sure you get one suitable for your needs is to prioritize the aspects we’ve already discussed. For example, once you set your budget, ask yourself if you want an electric or non-electric tortilla press. When you get the answer to that question, ask yourself what size you prefer. What material should it be made of? How about the accessories and the warranty? By asking these questions, you create a small list of features that are important to you. Then you can look out for the product which fulfills your criteria. If you do this, there are high chances that you'll be satisfied with your tortilla maker for years to come. Whether you read this entire review or just the buying guide, you're in a better position to make an informed decision and spend your hard-earned money on a quality product. I’ve strived to cover all the important aspects and to give you practical insights when it comes to buying the right tortilla maker.